Microsoft Partners NYSC to Unveil YouthSpark Initiative - Corpr! Microsoft has created a platform for Nigerian youths to learn leadership and life skills that will address their unemployment caused by lack of skills which is one key factors hindering economic growth in Africa. Through YouthSpark, and as part of the commitments announced earlier this year through the Microsoft 4Afrika Initiative, Microsoft intends to create opportunities for over 300 million youths in more than 100 countries during the next three years. This company-wide initiative includes: Corporate Social Investment (CSI) and other company programmes, both new and enhanced, empowering youths to imagine and realise their full potential by connecting them with greater opportunities for education, employment and entrepreneurship. This effort is put together by Microsoft Nigeria in partnership with the National Youth Service Corps (NYSC), the largest gathering of youths in Nigeria; Mind the Gap, a job creation, employability and social entrepreneurship incubation programme; and Future Enterprise Support Scheme, an online community where young people can come together to share knowledge, ideas, tips and resources. He further explained that YouthSpark is tightly aligned to the Microsoft 4Afrika Initiative, a new investment in the Continent to help Africa improve its global competitiveness. “By 2016, the Microsoft 4Afrika Initiative plans to help place tens of millions of smart devices in the hands of African youth, bring 1 million African small and medium enterprises online, up-skill 100,000 members of Africa’s existing workforce, and help an additional 100,000 recent graduates develop skills for employability, 75 per cent of which Microsoft will help place in jobs. “These new commitments through YouthSpark in Nigeria will contribute significantly toward delivering on these goals.” he said. The Director General of NYSC, Brigadier-General T. Okore-Affia, who was also represented by Deputy Director, ICT, NYSC, Isaac Obiwumma, further charged the corp members to take advantage of this opportunity to be the best in their chosen field. Speaking also, the principal partner E-Green & Coordinator of Mind the gap career mentoring programme, Mr. Tayo Olosunde, explained that the YouthSpark launch in Nigeria has opened up an authentic platform to mind the gap and leapfrog Nigerian graduates. Speaking in the same view, Executive Director of The Future Enterprise Support Scheme Mr. Chude Jideonwo, added, “I am proud of Microsoft for identifying what is the most urgent problem facing the continent’s young people – jobs. We speak often of Africa’s demographic bonus, but unless we tackle the issues of unemployment and employability, that will become a demographic burden. 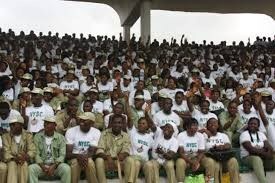 NYSC Releases Timetable For Prospective 2017 Corps Members.